Presentation of research topics developed by the team of François Leulier (in French). English presentation of research topics developed by the Leulier lab (December 2017). Animals carry dynamic microbial communities on their mucosal surfaces with which they establish complex reciprocal interactions. These interactions contribute to many aspects of normal host physiology. In the gut, these microbial communities called the microbiota and dominated by bacteria enhance digestive efficiency by providing metabolic activities aiding their hosts in maximizing extraction of dietary energy. In addition, the gut microbiota both promotes proper immune system development, local immune homeostasis and limits pathogen colonization. 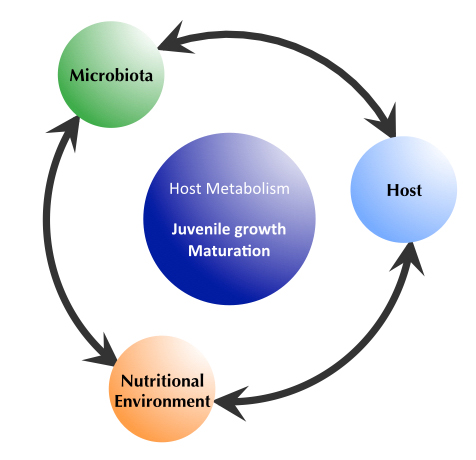 In return, the microbiota derives benefit from the association with its host by inhabiting a nutrient rich environment, the host providing “le gîte et le couvert” (i.e “board and lodging”). 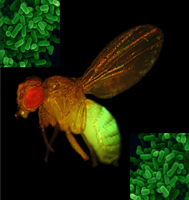 This mutually beneficial or mutualistic interaction relies on a homeostatic host/microbiota relationship,when deregulated this relationship may result in pathological outcomes such as episodic infectious diseases, chronic inflammatory diseases, metabolic disorders or even some forms of cancer. Despite recent progress, an integrated view at whole organismal scale of the physiological benefits associated with host/microbiota relationship remains elusive. Hence, the molecular mechanisms through which the microbiota exerts its beneficial influence are still largely undefined. The paucity of functional evidence is particularly evident for nutritional complements called "probiotics" (defined by the Food and Agricultural Organization and the World Health Organization as “Live microorganisms which when administered in adequate amounts confer a health benefit on the host"). These microorganisms correspond to selected strains of bacterial species of the Lactobacillus and Bifidobacterium generacommonly found in the human and animal intestinal tracts. 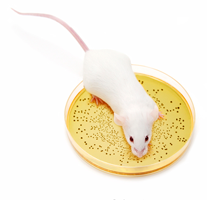 However, despite intense marketing campaigns by agroalimentary companies advertising the beneficialeffects of probiotics on human and animal health, the European Food Safety Authority (EFSA) has rejected few years ago most claims on probiotics health benefits in Europe due to insufficient research and no conclusive proofs.This scarcity of experimental evidence highlights the need for revisiting intestinal bacteria-mediated physiological benefits and to invest into basic and clinical research efforts for the accumulation of knowledge about beneficial host/intestinal bacteria relationships and translate this knowledge into innovative and efficient therapeutic strategies. 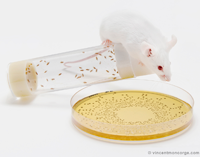 In this light, the use of experimental animal models to evaluate and clarify the impact of intestinal bacteria towards their host physiology should be of great help. To this end, we are using two model organisms, an invertebrate model, Drosophila melanogaster which allows deep and robust functional approaches to unravel the molecular mechanisms at play and a mammalian model, the common mouse (Mus musculus) allowing the validation that concepts and mechanisms uncovered in Drosophila are conserved in mammals. Our results, obtained since 2011 demonstrate that the intestinal microbiota is necessary to host physiology, in particular to maintain optimal host juvenile growth. This link between microbiota and juvenile growth is particularly evident upon chronic undernutrition. These observations reveal the intertwining between the nutrition, microbiota and host physiology. In addition, we have now identified bacterial strains of the genus Lactobacillus present in the intestine of many animals including humans capable of mimicking microbiota's effect on host juvenile growth. 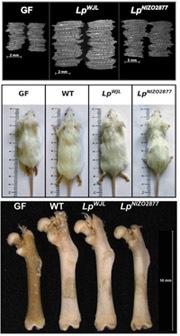 Our current work aims at identifying the molecular underpinnings of this phenomenon in bacteria, flies and mice and at developing the proof of concept that interventions with Lactobacilli would favour healthy growth in the general population and buffer the deleterious effects of chronic undernutrition in population at risk. Our experimental approaches in bacteria use forward genetics, experimental evolution and functional and comparative genomics. 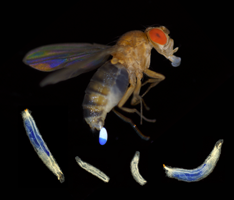 In drosophila and mice, our approaches rely on functional genomics and genetics coupled with physiological and metabolic studies. Finally we are establishing links with industrial partners to apply our concepts to the human population and animal breeding. "Brevet: Composition de lactobacillus permettant de favoriser la croissance juvenile humaine et animale en cas de malnutrition"